Your child has a runny nose, watery eyes and is more tired than usual. She’s also congested and has a headache. Is it allergies or a cold? Sometimes it can be hard to tell the difference between seasonal allergies and the common cold – especially in kids. Use the information below to help you determine seasonal allergy symptoms in kids. So how do you know what your child has? We talked to Dr. Justin Greiwe, an Allergist-Immunologist in Cincinnati, to help us better understand how to know whether our kids have a cold or seasonal allergies. Read some of his tips below and then watch the video to learn more. Colds usually run their course within 7 – 10 days. Seasonal allergies last as long as your child is exposed to the allergen – which could mean an entire season – or until the flowers making them sneeze have been removed from the house. While oftentimes parents may think that their baby has allergies after dealing with a runny nose for months, it’s very rare for kids to experience seasonal allergies until they’re 4-6 years of age. Most likely your newborn or young toddler’s stuffy nose is from exposure to common viruses that they haven’t experienced before. Allergies are hereditary, so if you have allergies, it’s very likely that your kids will too. Sometimes you may not even realize that the cold you get every spring is actually seaonal allergies until your child is diagnosed with seasonal allergies. Think Your Child Has Seasonal Allergies? If you think your child has seasonal allergies, we’re here to help! Step 1: Stock up on Boogie Wipes® Saline Nose Wipes! While they won’t put an end to seasonal allergies, Boogie Wipes® saline nose wipes play an important role in helping your children find seasonal allergy relief. Infused with natural saline, Boogie Wipes® saline nose wipes make it easier to wipe away mucus, while remaining gentle enough to comfort stuffy noses. Because saline is natural and hypoallergenic, it can soothe even the most delicate skin and reduce irritation. Keep them on hand to soothe your kids’ tender noses throughout allergy season. 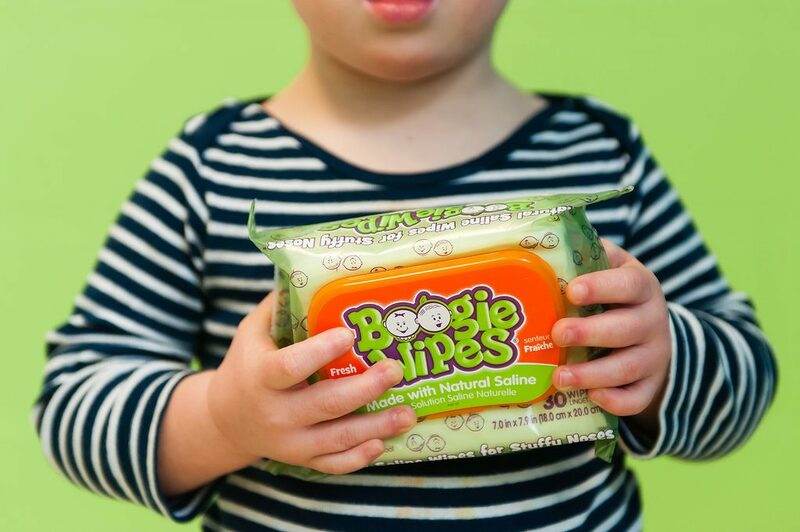 Learn more about the natural ingredients that make Boogie Wipes® saline nose wipes special. From identifying seasonal allergy symptoms to sharing natural allergy remedies and the best ways to find seasonal allergy relief, be sure to visit our allergy page for more seasonal allergy information for kids. Make an appointment with your pediatrician who may suggest allergy medication or an appointment with a specialist.